The friendly barking of dogs greeted us when we arrived at the SPCA Animal Centre in Rabat (Victoria) on Gozo Island. 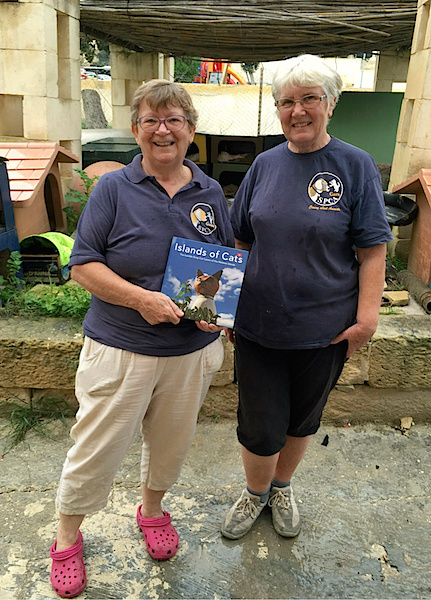 As usual Val and Jane were hard at work with their never ending chores, but were happy to take a few minutes break to receive their well deserved copy of ‘Islands of Cats’. Peter, the stray animal officer in Gozo and featured in Islands of Cats together with Val, had been called away for the day. So regular volunteer Jane was happy to pose for him. And as with all the carers, we wished we could do more to help their vital work. You can read more about Peter, Val and the SPCA Gozo in 'Islands of Cats' on pages 117-119.